As I watch the election results coming in, I thought it would be as good of a time as any to post this recent photo of Paul McCartney and Hillary Clinton. 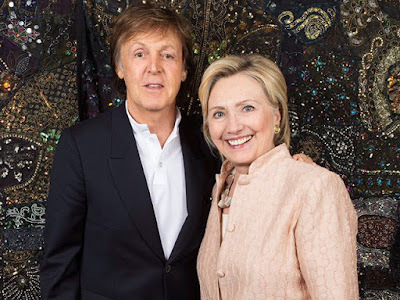 I remember that when Bill Clinton was president, he stated many times what big fan of the Beatles, and especially Paul he was. Paul sent him a copy of "Flaming Pie" to the White House. Please note: I will not publish any political comments. I am posting this not because of any of my own views, but because it shows someone who met one of the Beatles for real. If Paul had posed for a photo with Trump, I would have shared it as well.